My sweet Sophia, barely four years old at the time, whispered this sweet prayer. There is nothing flashy about a child’s prayer. Yes, sometimes they are silly and sometimes they really don’t make sense, but they are a constant reminder to me of how God wants US to come to Him. Routinely in Jesus’ ministry, children were not only welcomed, but also served as examples of kingdom life. Children matter to Jesus. As a parent, this resonates with us. We have been given these precious little ones to steward, shape, train, and ultimately release one day. So where do we begin? How do we get started? There seems to be an overwhelming trend to start as young as possible with some sort of method or curriculum to help our kids connect with Jesus. Yes of course we want our children to learn about God, but what if we just started out simple? Really simple: with prayer. This is, after all, the first expression of faith in the Bible – a calling out to God. I think one of the most effective ways to teach a child to pray is to let them pour their sweet hearts out to God from a young age just as they are. Whether they are praying for their hamster or their sibling, God hears them. 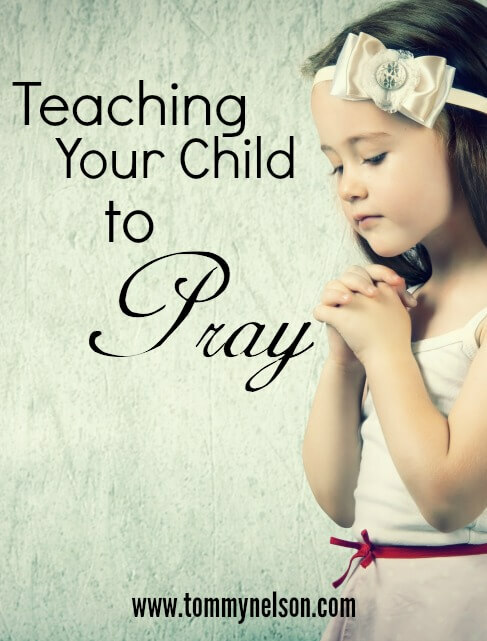 How can we encourage our children to pray? Pray with them. Direct them on who needs prayer. Ask them to pray with you. When our children were very little we would pray with them each individually every night before they went to bed. We would ask them if there was anything they wanted to pray about. We pray before meals. We pray when something comes up that we feel needs to be prayed about right at that moment. Why should we teach our children to pray? Life is full of uncertainties and heartache. If we can teach our children who to go to when they are little, they will carry that with them for life. We teach them to pray because getting older doesn’t always mean getting stronger. Regardless of age, we are powerless. And isn’t that what prayer is really all about? Going to God in our neediness and poverty, because we know in His abundance, He has what we need. Teaching our children to pray is showing them how to do life with God instead of doing it alone. Maybe you are a parent who wants to start praying, or maybe you are a parent who is already leading and teaching by example. Regardless, we all can use extra help and resources to help our children grow in the dependency on God. For sweet prayers to pray with your children you have to check out a beautiful book by Max and Denalyn Lucado. The Lucado Treasury of Bedtime Prayers is packed with prayers for you and children to pray throughout the day. This entry was posted in Blog and tagged children pray, kids praying, Moms, Prayer by Ruth Schwenk. Bookmark the permalink.